Greek speiraia, coil (possibly from its use in making garlands) ; Beauverdiana, named for Baron Palisot de Beauvois (1752-1820), a French naturalist. Alaskan Spirea is a member of the rose family, Rosaceae. The genus Spiraea comprises several plants whose blossoms produce the chemical salicylic acid, the primary component of aspirin which derives its name from this plant (Johnson et al. 1995, pg 56) . 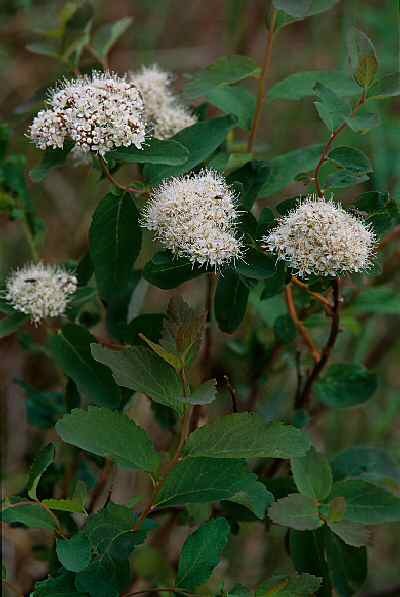 Alaskan Spirea is widespread. This particular one is growing on the edge of a bog, but it may also be found in woodlands, meadows, and tundra into the alpine zone.